Who should start a mobile storage business? Below is a list of who should start a mobile storage business, with each is one of the main reasons why they should. If you fall into one of the categories below contact us. Horizontal Lift offers the best lift in the mobile storage industry. Mobile storage is an easy addition to a moving company’s business model and probably where the business owners can see the most up side. 73% of the moving market is DIY in some form or fashion (meaning used no moving consultants). What! Yes, so moving companies are only capturing 27% of the moving market. People want a DIY option so give it to them. We have found the words portable and mobile can mean completely different business models. Traditionally “Portable” has been used for ISO containers that are delivered empty and picked up empty. The portable business mostly captures commercial/construction dollars not residential moving dollars. Why not have both sources of revenue with one lift? Horizontal Lift picks up both types of containers “white box” containers and ISO containers. This is anyone who operates a trash hauling business, porter potty business, basically anyone who runs trucks around and drops off/picks up things. The key here is if you’re already offering a similar service to mobile storage than it is an easy addition to increase revenues. 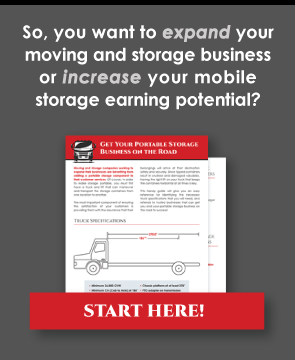 Why not capture more dollars from your market by adding a mobile storage service? Mobile storage is the most affordable way to enter the storage industry and one of the most profitable business models. The storage industry is one of the best to be in at all times. In the good years more people are upgrading homes they need storage while they remodel or move. In the down turns people need to down size homes and are either moving or storing their items until they can afford a bigger home. Every entrepreneur should want to be in a profitable recession proof business.